SERVED: I really didn't know who to SERVE this week since I've been at Disney World and SERVING the ride at the Mexico pavillion in Epcot seemed to be not-so-great. 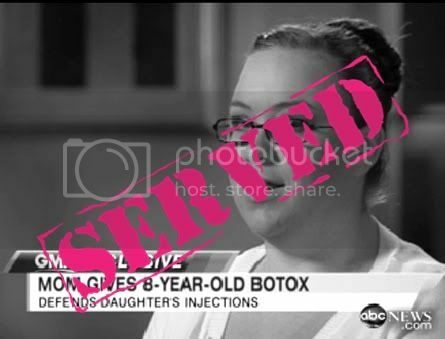 Thankfully, I caught up on my real news at Dlisted and read about Botox Mom on Good Morning America. Yes this mom injects her 8-year old daughter with Botox for pageants. This is repulsive. You need a SERVING for cruelty and stupidity. She's a child and kids are adorable as they are! Some wise viewers called child protection on Kerry for her amazing parenting skills so perhaps justice will SERVE this crazy pageant mom. What a terrible mother. And she's certainly sending the wrong message to her daughter. Stories like this make me so upset.